From village to village to the sea. A pleasant walk. 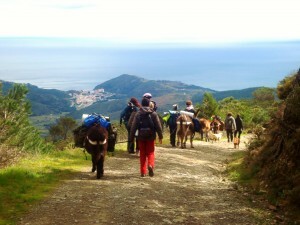 This walk takes you from the foot of the Pyrenees to the Mediterranean Sea. 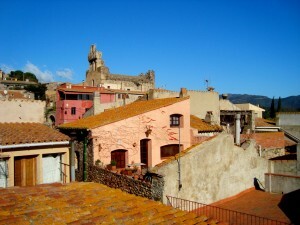 You discover the inland area of the Costa Brava. 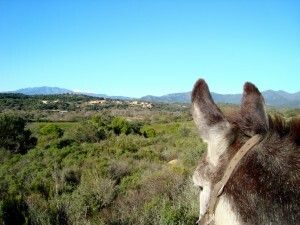 Our friendly donkeys accompany you from one accommodation to the next, through picturesque villages, idyllic olive groves, surrounded by vineyards, through the Albera Nature Park until you finally reach the Mediterranean sea. 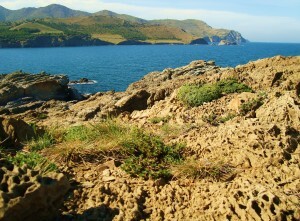 It is here, on the last day of the hike, that you can discover the small, idyllic coves of the nature reserve “Cap Ras”. Stop and relax. 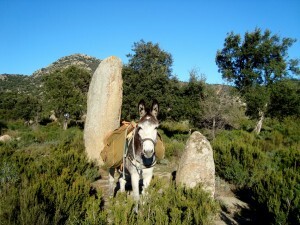 The difficulty of this hike does not require any prior experience in handling of a donkey. Before you depart we will give you the proper instruction required, explain how to properly care for, pack and lead the donkeys. If there are any problems we are of course always immediately ready to help. The holiday starts right after the arrival: We welcome you in the small, idyllically located country hotel “Pati de l`Albera” in St. Climent Sescebes. Once here you can first relax! The adventure begins with the preparation for the coming days. With a welcome drink we discuss the details of the upcoming experience. Continue through the enchanting Albera Natue Park. One of the impressive inhabitants of park is the Golden Eagle, which draws its extensive rounds in the blue sky. The fantastic view of the Gulf of Roses thrills any nature lover. 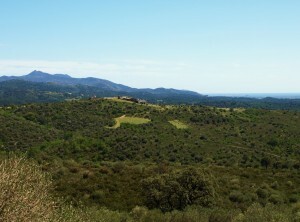 Continue downhill, past dolmen, unspoiled nature and always in the direct vicinity of the river. We are approaching the home of the Mediterranean tortoise and the medieval village Rabós, which is nestled into a terraced hill. Our destination for the night is the “Bed & Breakfast Rabós”. A cozy restaurant is also available here for an individual dinner. Day 6 – Let’s go to the Beach! 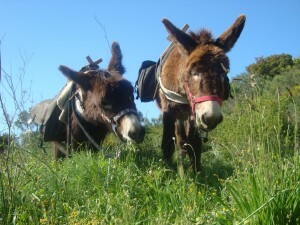 – The trail is, except in the hot summer months (July-August) available throughout the year and the dates are freely selectable if donkeys are available, . 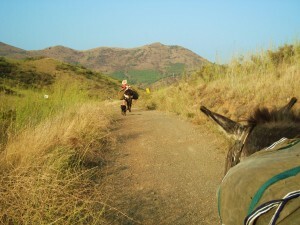 – Please when you do the booking of the accommodation specify them, that you do a donkey trekking with Burrotrek. – If you wish that we organize the accommodation, that’s no problem, but we have to charge an administration fee and Taxes. Accommodations have to be paid in cash after arriving there. – For lunch, there is the possibility to buy food in the shops in the villages, or from most accommodations it is possible to get a pick-nick. If you want a pick-nick, please inform the accomodation in advance. – For dinner every eavening you can have a meal in a restaurant near the accomodation. Except in Rabós, here you have to organize yourself in the evening. In the Casas Rurales you can use the kitchen. 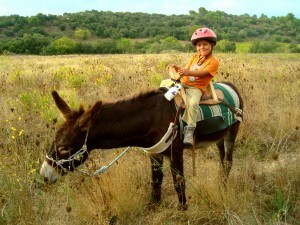 Check the website Rent a donkey. Here you will find information about prices and how the trails are organized. Double room 65€/night, including breakfast. Double room 72€/night, including breakfast. Double room 66€/night, including breakfast. 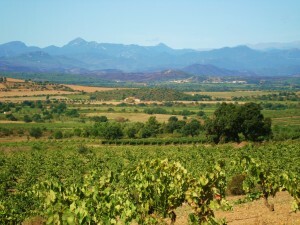 By car: From NII LaJonquera- Barcelona exit Capmany, Rosas on GI 602 about 9 km until Sant Climent. 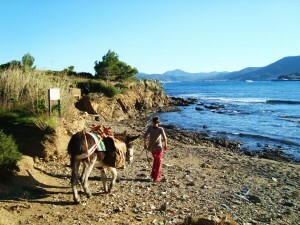 By public transport from Figueres: www.ampurdanbus.com to Sant Climent Sescebes.